A relatively new class of material, ULCB steels have been developed over the last twenty years or so with an aim to producing materials with all-purpose high strength and toughness. By comparing cooling behavior in CCT diagrams between HSLA-80 and a ULCB steel it is possible to make some interesting conclusions related to the micro structure of the materials and the challenges associated with classification using optical microscopy. Ultra Low Carbon Bainitic (ULCB) steels are a relatively new class of steel. Definition of Ultra Low Carbon is not straightforward either. Steels with C content in the range 0.01-0.03wt-% are termed as Ultra Low Carbon steels, but some have considered 0.01wt-% as the distinctive limit for Ultra Low Carbon and low carbon steels. The complex nature of the alloy interactions is not yet fully understood and thus further investigation is required to optimize the mechanical properties of ULCB steels while minimizing manufacturing cost. Ultra-low carbon bainitic (ULCB) steels, which have all-purpose high strength and toughness, have been developed significantly in the past twenty years around the world. The kinetics of strain-induced precipitaion occurring in this kind of steel have been investigated in depth, and it has been found that most of the precipitation-time-temperature (PPT) curves are of a C–shape. The research dealing with the influence of alloying elements on precipitation has also uncovered some valuable results. He et al reported that boron in Nb microalloyed ULCB steels increased the strain-induced precipitation rate of Nb(C,N). Akben mentioned that the Mn content further increased the precipitation, but did not affect “nose” temperature of the PTT curve. DeArdo showed that the addition of Mo has the same effect as Mn. Moreover, the interactions are also shown to exist among the microalloying elements Ti, Nb and V. Copper now acts as one of important addition elements, however, there are few reports dealing with the effect of different Cu contents on strain-induced precipitation and the effect of interaction of Cu and B. This paper aims to investigate the effects of Cu and B on Nb(C,N) precipitation by using stress relaxation technique with Gleeble 1500 dynamic thermal-mechanical simulator. Generally, these kinds of steels are processed via thermo-mechanically controlled processing (TMCP), which classically consists of three stages. During the roughing stage, austenite grain size is refined due to repeated cycles of the recrystallization process. In the second (controlled rolling) stage, the austenite is deformed in the non-recrystallization temperature regime, which brings significant refinement to the final microstructure. In the last stage, accelerated cooling can be applied to refine the resulting ferrite grain size or to suppress the formation of polygonal ferrite and facilitate the formation of lower-temperature transformation products such as different types of bainite. The aim of Antonio Augusto Gorni and Paulo Roberto Mei work was to determine the continuous cooling austenite transformation (CCT) diagrams of HSLA-80 and ULCB steels and its performance during age hardening. 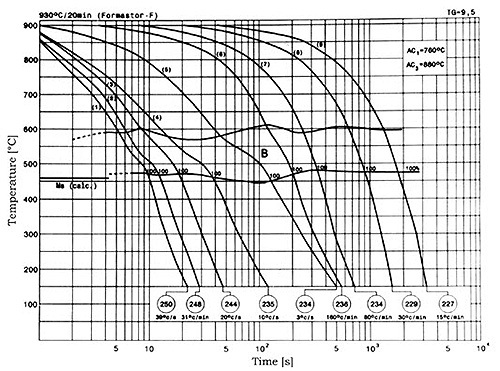 The CCT diagrams determined for the HSLA-80 and ULCB steels are showed, respectively, in Figs. 1 and 2. The first figure shows that the HSLA-80 is basically a bainitic steel, as it detected a very low fraction (5%) of ferrite when the samples were cooled at 0.5°C/s or lower cooling rates. The same fact was verified for the ULCB steel, in which hardenability is even greater, as a ferritic field did not even appear in Fig. 2. It must be noted that, in this case, the synergistic effect between Nb and B and the presence of Mo had an essential role in this result. The low concentration of C in these alloys, particularly in the case of the ULCB steel, decrease or suppress the cementite formation between platelets in the bainitic ferrite matrix. Instead of cementite there is the formation of the so-called MA constituent, that is, a mixture of martensite plus retained austenite. As a matter of fact, the classification of the microstructure of the ULCB steels as seen in optical microscopy is very difficult, due to the acicular character of this constituent and the lack of resolution of this analysis method. 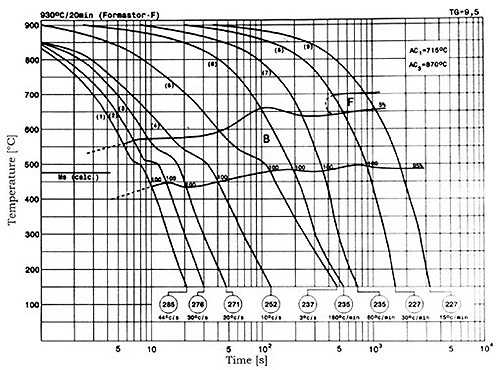 Figure 1: Continuous cooling transformation diagram (CCT) determined for the HSLA-80 steel studied in this work. Figure 2: Continuous cooling transformation diagram (CCT) determined for the ULCB steel studied in this work. Figure 3: Hardness evolution in function of cooling rate observed for the HSLA-80 and ULCB steel samples used for the determination of the CCT diagrams.